Data backup is the mainstay of daily data protection for any level, from a standard home PC or desktop to a most advanced server network. To make computer data backup less annoying and as more automated as possible, Handy Backup brings a lot of features to back up your data smoothly and quickly. If you need, backup your data to and from many local storage devices, including computer hard disks, external USB drives such as HDD, SSD and memory cards (with a possibility to trigger a task when you plug a task-related device to a PC slot) etc. For saving your data backup, you can also utilize such online (offsite) storage as FTP/SFTP/FTPS servers, remote drives, NAS units, S3-driven clouds such as Amazon S3, commercial cloud services (Google Drive, OneDrive, Dropbox etc. ), WebDAV clouds and other. Handy Backup can synchronize data between two folders, either on local or online storage, with a forced “master-to-slave” or mirror synchronization type. It also has a method for mirroring complex information such as databases through data backup and restore to another place. Handy Backup allows making complete data backup by saving a whole image of a drive or a partition, and then restoring it to another drive (including a scratch disk). To do it, Handy Backup delivers the dedicated Disaster Recovery utility, which is free for versions with disk image plug-ins. With Handy Backup, you can create any types of automatic data backup tasks, including saving files, folders, Windows libraries and registry, FTP content, shared network resources, disk images, databases, virtual machines and cloud services such as Amazon S3, Google Drive, Dropbox, and OneDrive. For simple and reliable data backup to NAS, FTP/SFTP/FTPS devices, cloud storages, please use the Professional version or higher. Free full version - 30 day! You can back up your data automatically at an exactly defined time and with an exact interval from minutes to months, as well as triggering a data backup task by some system event such as user logon/logoff. You can also automatically re-run missed tasks. Learn more about automatic backup software. Handy Backup can make no distractions during backup your data if you run it as Windows service. 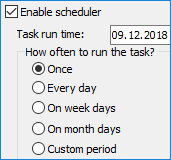 In this mode, the program does not show an interface window and executes pre-defined tasks by schedule. You can also set up an email notification to be sure about task activities. Handy Backup provides internal tools for compressing all data backup content into a single or separate ZIP files, and a modified BlowFish encryption option. In addition, it supports different methods of traffic encryption such as SSL/TLS for backup data offsite (e.g. email backup). Finally, you can run a batch file or some external utility either before or after a task, or before and after it. 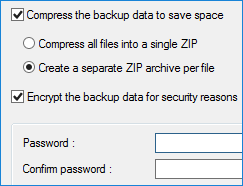 This option is very useful for making a data chain workflow, for stopping some data process to take cold backup (by default, handy Backup almost always makes hot data backup), and so on. 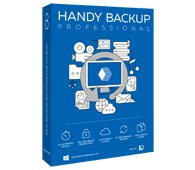 Handy Backup always tries to preserve the original data format when it stores data copies. Therefore, you can use most data backup files directly from a copy, for browsing, moving, viewing, deleting the files, or even for restoring a file manually without a full auto recovery task. For some complex data, such as disk images or SQL databases, there are no native formats available. Instead, Handy Backup implements other comprehensible formats, e.g., VHD files for drive images, SQL command sequences (dump files) for MySQL and so on. Among all data backup solutions, Handy Backup provides a lot of comfort and preserves uniformity of all procedures for any data type. Try its might by downloading a last version with all functions and plug-ins for a 30-day free trial period!